Carolina Beach, NC – The past and present collide happily at Carolina Beach and Kure Beach, North Carolina, forming a perfect mix of things to see and do that combines new features with historical milestones. From the Carolina Beach Boardwalk to Fort Fisher State Historic Site, several present-day attractions offer visitors a nod to the past. These coastal communities are ideal for groups like multi-generational travelers – there’s plenty to please everyone from grandma and grandpa to the grandkids, and everyone in between. Then: Captain John Harper built the first boardwalk in 1887 as a walkway on the sand made from boards so visitors could stroll the beach without sinking into the sand. Over the years, the boardwalk was rebuilt and restored numerous times as a result of natural wear and tear. Now: The vintage icon has since made Budget Travel’s list of America’s Most Awesome Boardwalks and has been featured by CNN, FOX News and USA TODAY. The Carolina Beach Boardwalk was recently renovated to greatly enhance beach access, special needs accommodations and enjoyment of the dune ecosystem. Phase two of the facelift will include the addition of even more amenities for visitors to enjoy, including an arcade, swings, gazebos, cool-off stations, landscaped coves, public art, historical and environmental educational kiosks, picnic facilities and open space for music, art and events. Then: Fort Fisher served as a vital port during the Civil War, allowing blockade runners to supply necessary goods to Confederate armies inland. By 1865, the supply line through Wilmington was the last remaining supply route open to Robert E. Lee’s army. Fort Fisher finally fell after a massive assault in 1865 and the Confederacy was defeated. Now: Today, visitors can tour the remains of the fort at Fort Fisher State Historic Site – approximately 10 percent of the fort still stands along with a restored palisade fence. A scenic trail leads tourists around the grounds from the visitor center to the rear of the fort. Exhibits line the path, showcasing items recovered from sunken blockade runners. Then: Legend has it that shagging and beach music originated at Carolina Beach around 1948 and became widely known by the term “beach music” by 1965. The genre died out in the late 1960s but experienced a revival a decade later and is still going strong today. The first Carolina Beach Music Festival was held in 1985. Now: Billed as “the biggest and only beach music festival actually held on the beach on the North Carolina coast” and one of the longest running beach music festivals in the United States, the 30th Annual Carolina Beach Music Festival drew several thousand people in June of 2015. The event featured live beach music bands playing everything from the classics to today’s hits. Then: L.C. Kure built the original Kure Beach Fishing Pier in 1923. The pier was rebuilt and restored several times as a result of wear and tear over the years. Now: The Kure Beach Fishing Pier is now one of the oldest piers on the Atlantic Coast. It remains an iconic symbol of Kure Beach with many families bringing their children and grandchildren to fish off the pier year after year. Visitors can not only fish and buy tackle, bait, and rod and reel combos, but can also stroll the 711 feet of wooden planks, visit the concession stand, play at the arcade and shop the large souvenir area. Then: Travelers have been visiting Carolina Beach and Kure Beach long before high-rise condos and hotels were built on the coast. Popular guest accommodations in Kure Beach have their beginning decades ago, like the Beacon House Inn Bed & Breakfast that was originally built as a boarding house in the 1950s, the cozy Palm Air Cottages that were built in the late 1950s and early 1960s, and the Moran Motel, a one-story wing building that originated in 1959. With its vintage jade-green and pink-brick color scheme, the Moran Motel has been used in a number of feature films and TV movies. In Carolina Beach, the Joy Lee apartment complex has been enjoyed as a vacation spot since 1945, while the wooden-framed Wanda Inn dates all the way back to 1910. Now: Although many older-style motels and apartments used to dot the coastline, there are still a few that have held strong. The Beacon House Inn Bed & Breakfast was converted in the mid-1990s into a B&B that still holds its tasteful charm and character thanks to tongue-in-groove original pine board walls, vintage photographs and memorabilia blended with modern amenities. The private, poolside Palm Air Cottages still attract generations of families each year. The Moran Motel continues to thrive as guests now bring their grandchildren and great-grandchildren to delight in its retro-style comfort. There is also a full-service, oceanfront Courtyard by Marriot Carolina Beach and a Hampton Inn and Suites, located adjacent to the Carolina Beach Boardwalk, coming soon. Carolina Beach offers the best of a North Carolina beach experience from the past with a family-friendly spin for today. Experience a nationally recognized seaside boardwalk, Carolina Beach State Park, one-of-a-kind events, world-class fishing, miles of beautiful beach, and all kinds of people united by their love of good times. There are a lot of beaches in North Carolina, but only one Carolina Beach. For more information, go to VisitCarolinaBeachNC.com or call (800) 641-7082. Find us on Facebook at Facebook/CarolinaBeachNC and Twitter and Instagram, @CarolinaBeachNC. Kure Beach offers a naturally beautiful setting in a peaceful, small-town atmosphere. North Carolina’s small wonder lets you relax and reconnect at the kind of naturally beautiful beach you visited as a kid, while also enjoying nearby state attractions like Fort Fisher State Historic Site and the North Carolina Aquarium at Fort Fisher, an oceanfront park, and a historic pier. 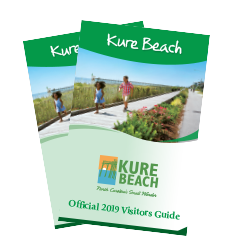 For more information, go to VisitKureBeachNC.com or call (800) 631-1460. Find us on Facebook at Facebook.com/KureBeachNC and Twitter, @KureBeachNC.